In Part 1 (here), we looked at the way in which General Motors converted its A, B and C body shells from the old pre-war styles to new post-war designs. Well, the A and C bodies at least. 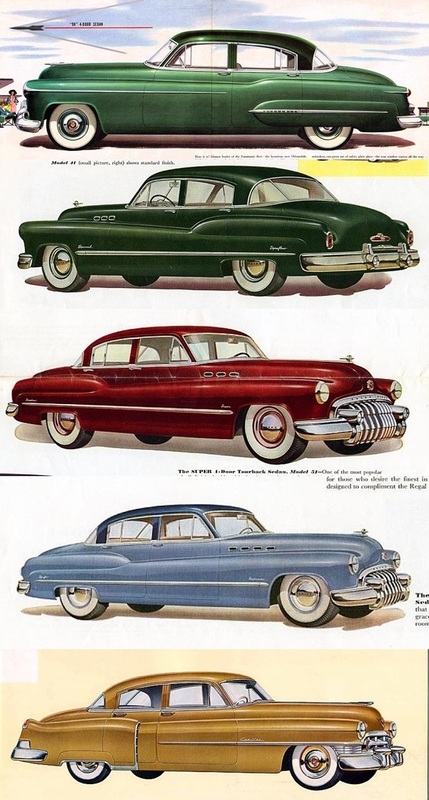 We established that there really was no B body car produced for 1949, unless we count the handful of warmed over ’48 Buick Specials (that were called ’49s) before Buick pulled the plug on them in December of 1948. 1950 would be different. Or would it? The A body situation was unchanged for 1950. All Chevrolets, all Pontiacs and the Oldsmobile 76/88 made up the choices under the “A” column. This made sense as those cars had all been brand new the previous year. But when we come to the B and C body situation of 1950-51, another mystery presents itself because the lineup was quite unlike anything from GM’s recent or subsequent history. Was the 1950 model a year of new B and C body cars in the normal progression of GM’s postwar plans? Or was the new 1950 body an emergency makeover of the C body with some temporary alterations made to cobble up a B body so that Buick would have some Specials to sell? Let’s look at the evidence. The very first of these new models was the 1950 (or late 1949, if you prefer) Buick Special. Introduced on August 8th of 1949 (and in fastback “Jetback” versions only), the Special would be the first clue to a bold new direction in GM styling that was quite different from that of the new designs of 1948-49. 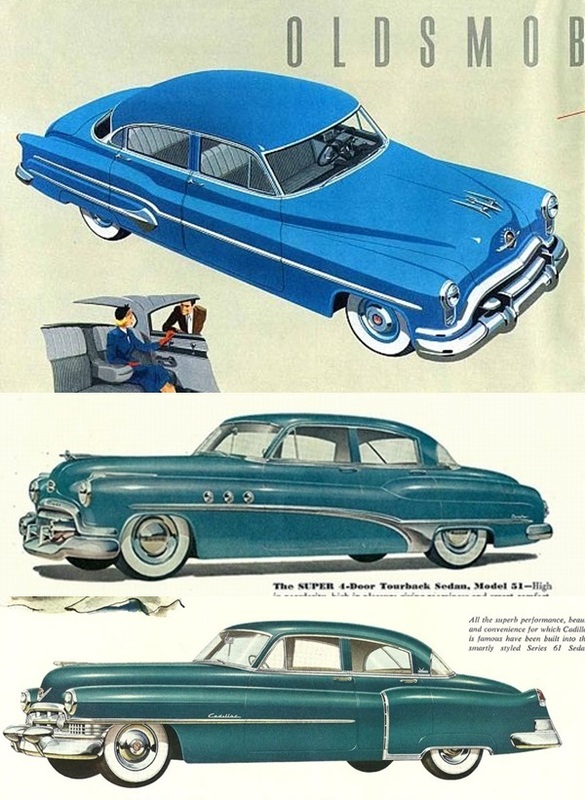 As we discussed last time, the Buick Special Tourback sedan and all the rest of the 1950 Buick models came along in due time, as did the Olds 98 and Cadillac 61, and all on a brand new body. We will get into the name for this body shortly (note the use of quotation marks when identifying the B body in captions to the pictures), but let us at least look at the variety of sedans that shared this new 1950 structure, whether called B or something else. The defining feature of this sedan body was the vertical C pillar and four window greenhouse, which was quite unlike any other roofline offered under the GM umbrella. What is unusual is that the Buick Special and the Buick Roadmaster shared the same body. At least one version of the Roadmaster. Also notable is that the Cadillac 61 got demoted to a lower level body than the Cadillac 62 this year, a first for this split since 1947. Popular Science Magazine took a first look at the new Buick Special in its September, 1949 issue and called it “the biggest ‘big little’ car they [Buick] have ever produced.” Particularly odd was that the Special’s 121.5 inch wheelbase identical to that of the more expensive Super, with which it shared this body. The wheelbases of the other cars on this body were 122 inches (Oldsmobile and Cadillac) and 126 5/16 (Roadmaster). The Special was also within fractions of an inch of width of the larger cars, 79 13/32 inches vs. the bigger cars’ 80 inch widths. The big C body Buicks and Cadillacs were noticeably new this year as well on a brand new structure that was unequivocally a C body. 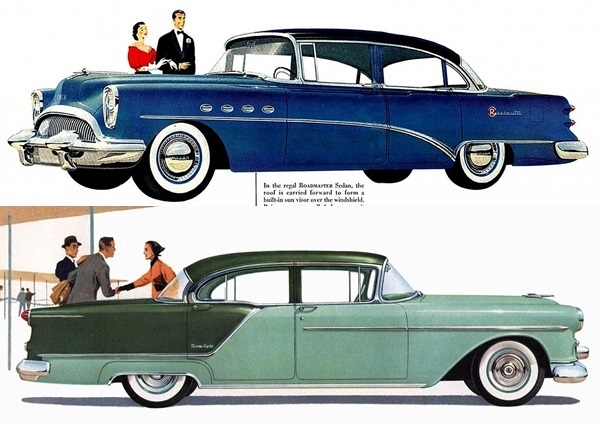 It is interesting that the Buick Super 126 employed a wheelbase of 126 inches, as long as that of the Cadillac 62 while the Roadmaster 130 carried a wheelbase of 130.25 inches. You can see that 1950 brought two variations on the new body. 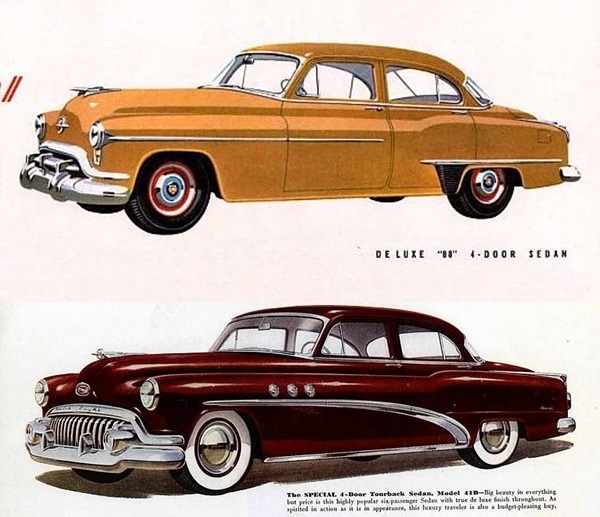 It also brought us two versions of the Buick Super and two versions of the Buick Roadmaster, with the “normal” versions that shared a roof with the Special and the plus-size longer wheelbase versions that used the Cadillac roof. The six-window body was unquestionably a C body. But was the four-window body a B body? Or was it a C body that got some minor modifications to temporarily fill a gaping hole in the Fisher Body lineup? 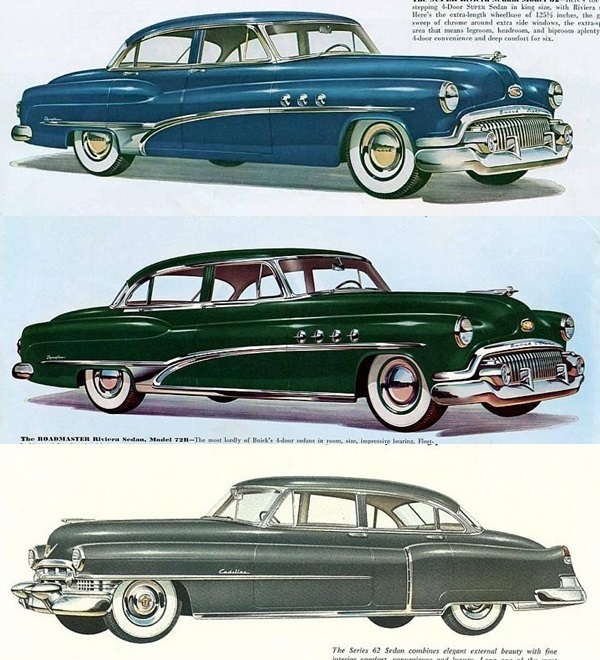 No matter how we resolve the body nomenclature, we have an anomaly in 1950: Buick either built a C body Buick Special or it built a B Body Buick Super and Roadmaster. Either choice was a big departure from both Buick’s tradition and from the way the Buick lineup would progress into the future. All of this quibbling over whether there was a 1950 B body makes no sense until we look at 1951. Because in 1951 one more body joined the party. Once again the A body cars remained unchanged other than in some styling detail and the discontinuance of the Olds 76. This would be the last year of the A body Oldsmobile 88 line, which had been pared down to only two and four door sedans. Some sources indicate that the A body 88 did not make it all the way through the 1951 model year. In January of 1951 a new body joined the array. Sources indicate that GM called this the OB Body and it included the 1951 Oldsmobile Super 88 and the 1951 Buick Special. This body is interesting because it transitioned the Olds 88 out of the small A body and into a larger car. Although it really wasn’t a larger car in that its wheelbase was either the same 119.5 inches on the new OB body as it had been on the A body or a whopping 1/2 inch increase to 120 inches, depending on which source you want to believe. It should also be noted that both the A body 88 and the OB body Super 88 show identical figures for width: 75 3/16 inches. The new one at least packed on an extra hundred pounds or so and was styled in line with GM’s then-current direction instead of the 1948-49 look that GM styling had abandoned. This new body was also notable for providing the basis for the second completely new body for the Buick Special in as many years. It was substantially narrower than the 1950 model at 76 11/16 inches (down from fractionally under 80 inches), but still retained the 121.5 inch wheelbase from the otherwise larger 1950 version. As tempting as it might be to say that the 1951 OB body was the new version of the B body, this would not really be accurate as the old contender for the B body name remained in three different showrooms. 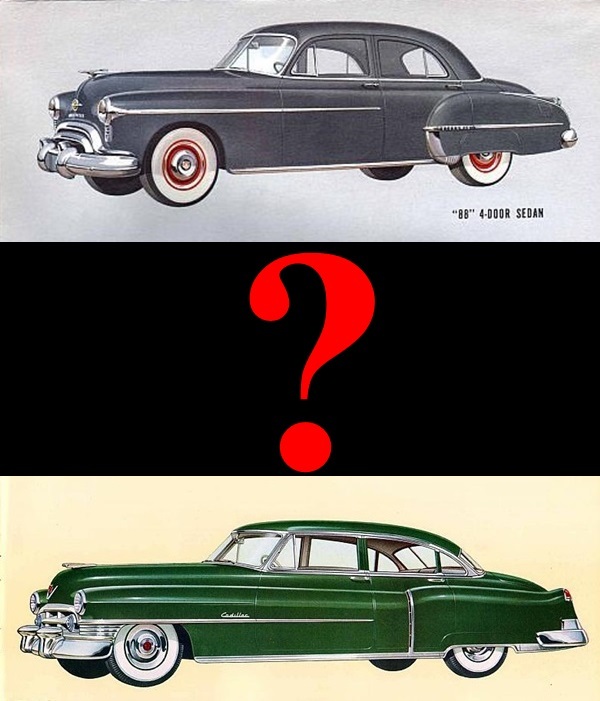 That vertical C pillar is the giveaway in both the Olds 98 and in the Cadillac 61, so if these cars had been built on the four window B body in 1950, a B body it likely still was in 1951. Buick’s use of this body was a bit mysterious. The Model 51 Super sedan was relatively unpopular, being outsold by the C body Super roughly 9:1. This is somewhat odd, given how broadly the body had been offered by Buick in 1950. 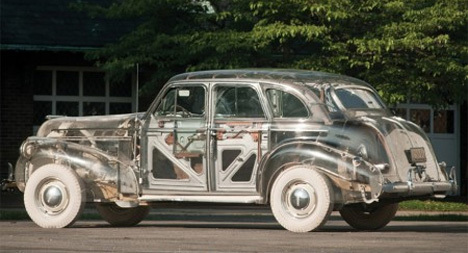 The larger mystery is the Buick Custom Special sedan (Model 42). This model shows up in a brochure, as shown above. However, according to production figures at Buicks.net no Model 42 sedans were actually built. The genuine C body cars were back too, and largely unchanged. 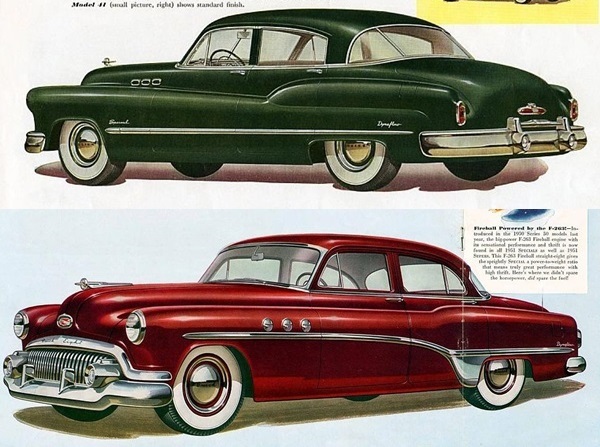 One difference was that this year the Buick Super and Buick Roadmaster would each come in a single flavor and on a single body instead of the double helpings of each that dealers had seen in 1950. It is immediately apparent that things were simplified to a considerable degree by 1952, which displayed a sense of the normal which had been absent from GM’s offerings for several years. The A body was used by just two Divisions in 1952, Chevrolet and Pontiac. Also this would be the final year of the fastback versions of A body sedans, cars which have been outside of the scope of this examination. The OB body was the last B body standing, as what had passed for a B body in 1950-51 was now gone across the board. One question which will go unanswered in this series is whether the OB body served as a basis for the new 1953 Chevrolet and Pontiac A body. The ’53 Chevrolet’s increase in width over the ’52 (from 73 15/16 inches to 75 inches) to the ballpark of the other OB cars makes one wonder. Finally the big C body cars continued the new normal which they had settled into the previous year, becoming the lone users of any form of the 1950 body, now in its third year of use. The Buick Super, Roadmaster and Cadillac 62 would be the sole users of the big C series body for the next several years. 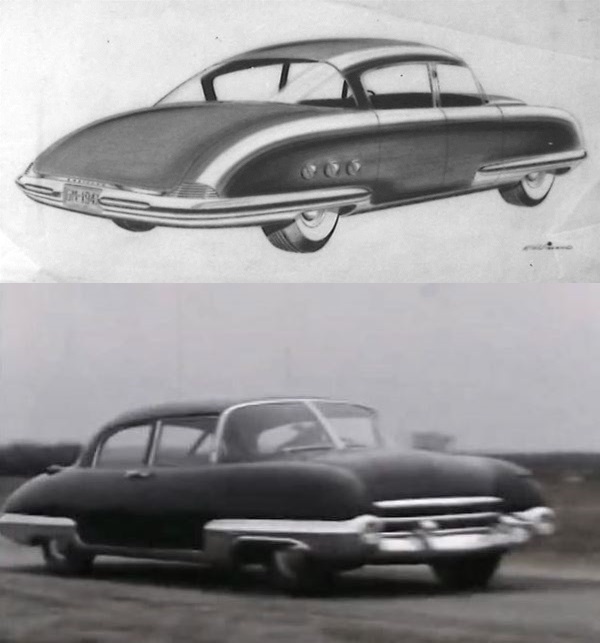 These Buicks measured 80 inches in width, a figure identical to the “B body” Buick Super and Roadmaster of 1950-51 (and within a fraction of an inch of the 1950 Special). All of this confusion calls for a little examination and analysis so that we can make some sense out of this game of musical bodies that General Motors had been playing in this period. First, there is no doubt that the ’51 Buick Special was on an entirely different body than the 1950 model (which had been an entirely different body from the ’48/early ’49). The February 1951 issue of Buick Magazine referred to “An entirely new, lighter, smaller Special series.” And Wilbur Shaw tested the new ’51 Special in Popular Science Magazine’s March issue, noting that it was nearly three inches narrower than last year’s car, although it retained the 121.5 inch wheelbase of the prior version. So which one of these is the “real” B body? Numerous sources call the 1950 four window body (with the vertical C pillar) a B body, with the 1951 Special/Super 88 being the OB body. Could that stand for “Other B” body? Which reminds me of the second Bob Newhart show with the three local bumpkins who were always introduced as “Hi, I’m Larry. This is my brother Darryl. And this is my other brother Darryl.” So perhaps GM had a B body and another B body? Or maybe it stood for “Oldsmobile B body” because that Division would be the biggest OB customer until the new B and C bodies came along for 1954. Top: Rendering done by Ned Nickles or R.H. Wieland. Photo source: Hemmings Daily. Bottom: One of two running prototypes of the 1946 Cadillac Interceptor. Screen shot of film. Film source: Mac’s Motor City Garage. According to an article on the 1950-52 Buick and another on the 1948-49 Oldsmobile at HowStuffWorks.com, the 1948 C body had originally been planned as a B body, but was re-named for the more expensive cars well after the planning and engineering process had gotten underway. That 1948-49 C body design had been controversial among GM management, some of whom found the graceful aircraft- inspired design lacking in the kind of visual heft that its high-end cars should have. Harlow Curtice was apparently one of those people and, as one moving up in GM management at that time, was in a position to influence styling. This sketch for an alternative direction for the 1948 Cadillac (along with the Cadillac Interceptor prototype) is quite predictive of the direction the stylists actually went for the 1950 models, including the distinctive 1950-51 “B body” roof and the partially covered front wheels. This backstory leads to a question: With a new C body in 1948 and a new A body in 1949, the B body was likely due for an update for 1950. But did we actually see a new B body that year? Or was what has been called the 1950 B body actually a second emergency C body reboot (as had happened with the ’48 model) with a shortened variation to fill the gaping hole left by the still-unreplaced B body? I am tempted to call the two versions of that 1950 structure the C body and the C Minus body. 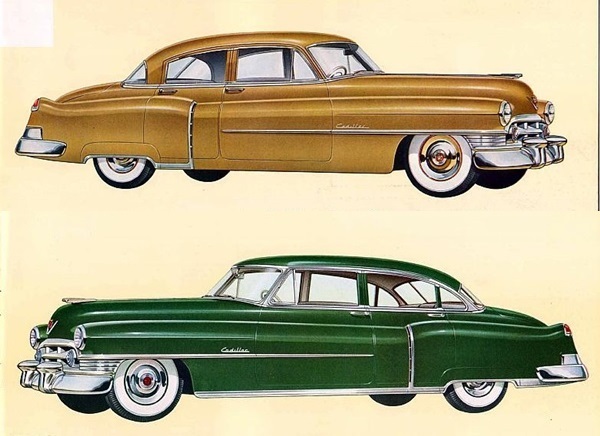 1950 Cadillac 61 (top) and Cadillac 62 (bottom). Do these cars exhibit a B body and a C body? Or two versions of a C body? Most sources say that there was both a new B and C body in 1950, with the main difference being in the roof structures. One example would be the Standard Catalog of Cadillac by John Gunnel, who states that the 1950 Cadillac Series 61 was on a new B body. He does not, however, explicitly examine the question head-on. Also, Richard Howard Stout wrote an article in the March-April 1977 issue of Special-Interest Autos called Body Politics, which extolled the genius of the interchangeability of panels between the B C and D bodies of 1951. His analysis, however, which assumes a common 1950-51 B body completely ignores the 1951 OB body which would become the undisputed B body in 1952 and remain so until new B and C bodies would be introduced for 1954. Thomas E. Bonsall has looked a little closer in The Cadillac Story: The Postwar Years and in Disaster In Dearborn: The Story Of The Edsel. In both books Bonsall has identified the four-window body as the B body and the six-window version as the C body, although he states that the C version of the body was a relatively simple stretch of the B body with a pair of extra quarter windows to fill the gap. 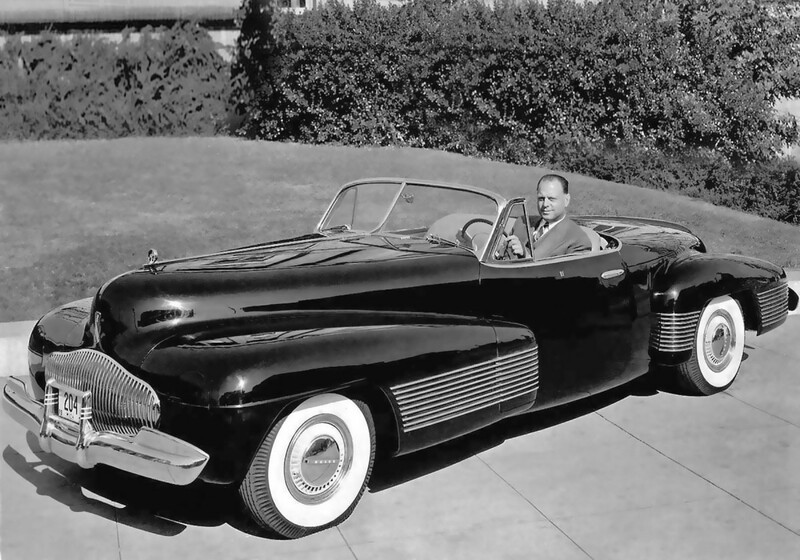 In The Cadillac Story, Bonsall gives some credence to the theory that the 1950 B/C body program was a crash program that was triggered by the boldly shaped 1948-49 cars coming from Hudson, Packard and Lincoln-Mercury. The 1948 C body styling had been a product of the Cadillac studio and had been the continuation of a design language that went back to Bill Mitchell’s 1938 Cadillac Sixty Special. Some in management felt that the 1948 design had missed the new trend towards a bolder, heavier look and lobbied for the weightier styling that came out for 1950, a look which was more derivative of Harley Earl’s 1938 Buick Y Job. 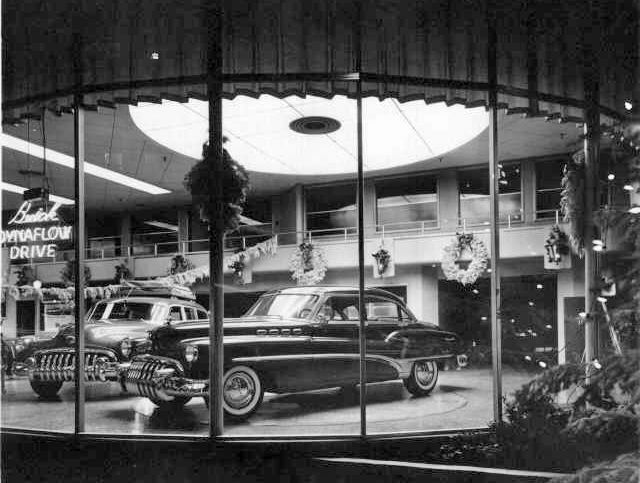 Knowing that in Harlow Curtice Buick had some powerful juice on the 14th Floor of the GM building, it is not hard to imagine Buick getting what Buick wanted. Bonsall’s look at the issue, however, was from a Cadillac-centric point of view and did not discuss why this new alleged B body had one of the shortest shelf-lives of anything ever built by GM. It is clear that the OB program had been given the green light well before the 1950 B/C program was even finished. In any event it would appear that the C body cars were driving the decisions on that 1950 body and that what was called a B body in 1950 was an unsatisfying stopgap, a view born out in how quickly that body dried up and blew away. The 1950 Oldsmobile 98 four door Town Sedan which, along with the Jetback version in each of the 1950 Buick lines, failed to make it beyond a single year of production. Bonsall’s Edsel book provided a look at GM’s body system through a different lens. In the chapter Learning Their A-B-Cs, Bonsall relates the experience of Richard Stout who had spent some time in GM design before moving to Ford. He had attempted to school Ford on the workings of the GM body-sharing program. He is reported to have told of the existence of a program within GM to whittle each Division down to a single body for 1949-50. This version of events, however, again completely ignores the OB structure that was coming down the pike even before the 1950 cars were in showrooms. Also ignored is the wild proliferation of bodies at this time. 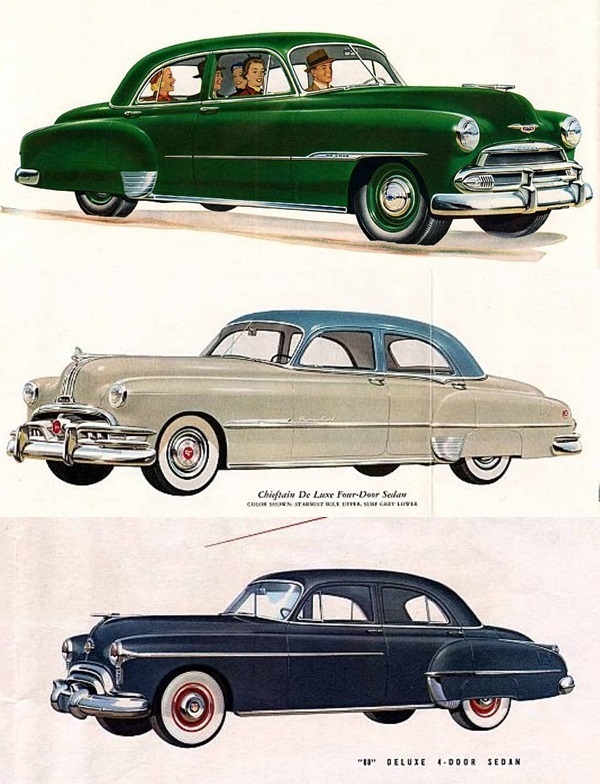 Not only were there A, B, OB C, C Special and D bodies in 1951, but within many of those series were highly specialized versions including two and four door fastbacks, coupes, hardtops, convertibles and station wagons. GM’s proliferation of models of the 1960’s was not a new thing. One final data point comes from the June 1951 issue of Popular Mechanics Magazine. In its Detroit Listening Post column, it was claimed that Fisher Body Division was struggling to meet demand for multiple bodies across multiple lines and was behind a push to cull styles. The B/C body fastback sedans were to be the first place to cut, proving to be another in a growing string of Bodies By Fisher that were one and two-year wonders. So what has been the point of this long, long X-Ray look at the General Motors bodies of 1946-52? We can see that the view close to the ground is not as clean as the “A, B and C body” theory as viewed from thirty thousand feet. GM was last to market with a fully new line of postwar cars and getting there involved multiple crash programs and U turns in product planning. The GM juggernaut of the early postwar period looks a bit more messy from up close, exhibiting significant confusion about what their cars were going to look like and how they were going to be built. What may be the most interesting thing of all is how this story has been told so seldom and and is so little known when compared to the equally tumultuous period leading to the 1959 models. History is messy business in general, and was particularly messy at General Motors after the war. If you are looking for a neat conclusion to this tale, I will offer you mine. When Buick and Cadillac people hijacked the 1948 B body program to make it a C body, this left the real C body program in place and on pace for 1950. But the problem was that this plan still left a hole where the B body was supposed to be. The only difference in 1950 was that Buick was not going to stand for being left for another year without a Special to sell. The 1950 body came in multiple wheelbases (as GM bodies always had) but also shared width and virtually all sheetmetal save the roof/greenhouse areas between the longer and shorter versions. My conclusion is that what people have called a B body in 1950 was really a C body with enough of a face-saving name change so that Buick could build a Special with it. The mess that was the 1950 B/C body program (along with the Korean conflict) likely put the “real” B body program behind. But it finally showed up in 1951 and the “C Minus” body of 1950-51 quietly went away after only two years. By 1954-55 GM would be back to a more traditional A-B-C body system, with some real distinction between the dimensions of each. This would be especially true in width with the 1955-57 A body being slightly under 74 inches wide and the 1954-56 B and C body cars measuring a bit over 78 and a bit under 80 inches, respectively. 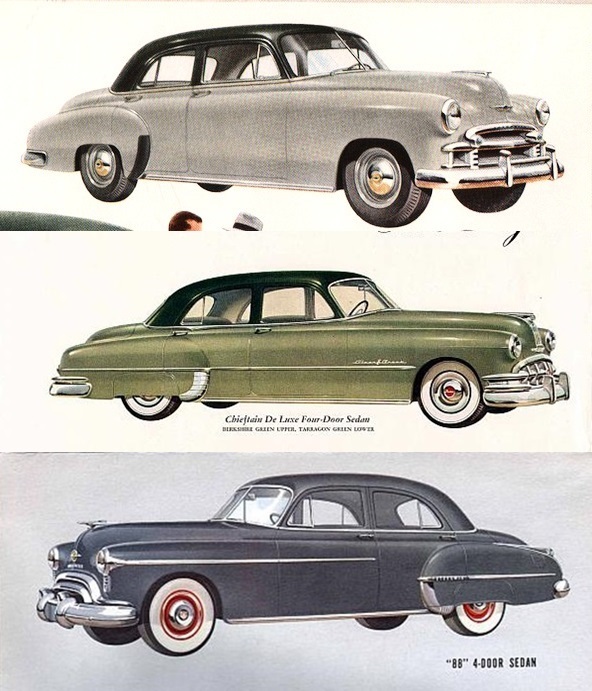 These newer cars showed some real variations in width that were not really seen in this 1949-52 period in which the middle bodies were quite close with either the A or the C in dimensions rather than a legitimate middle ground. We are all familiar with the story of how the 1949 Ford was a crash program started because management felt that the proposed design was too large and heavy for a Ford. The proposed Ford became a Mercury, the proposed Mercury became a Lincoln and the proposed Lincoln became the Lincoln Cosmopolitan. The Ford example is also a display of how this works when the decisions are made in time to make adjustments before plans are too far along. GM of 1946-52 shows how this same dilemma looks when the decisions were made too late or when there is enough of a budget that it doesn’t matter. The difference between GM and any other auto manufacturer at the time was that only GM could afford to change body designs nearly as frequently as hotel maids change bedsheets. Not every problem can be solved with enough money. But in automobile manufacturing most of them usually can be. One final point should be made, and it is this. It is to General Motors’ credit that as much turmoil as there was in its product planning, body engineering and design departments during this time period, its manufacturing and retailing operations were virtually unaffected. Not just any automaker could have pulled off so many whipsaw changes in its car bodies while maintaining the kind of quality that buyers had come to expect in their GM cars. And not just any group of stylists could have hidden so cleverly the rapid, multiple body changes that were going on in that period. Now that we have concluded this tale, you are hopefully in better command of a really obscure period in General Motors’ larger car lines – a period which involves as much grossly wrong online information as I have come across in quite some time. 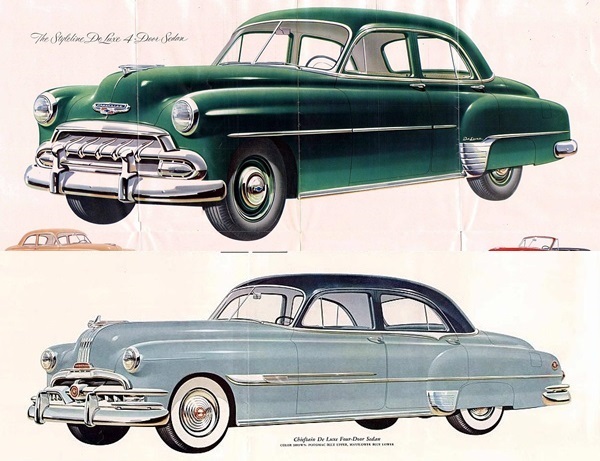 GM may have been the last car maker to accomplish a full model change after the war, but it was the first to manage two (three for the Olds 98) full postwar model changes in its Olds/Buick/Cadillac lines by 1952. And the most interesting part is that so many of us never noticed. I believe that you intended the width of the tri-five A bodies to be 74 inches, rather than the 54 inches as printed? Otherwise, a fantastic pair of articles. Even I, the Fifties GM junkie, learned things I’d never heard of before. Thanks for catching this typo. And thanks for the kind words. At first I wondered if these body changes and designations were unknown only to me due to never paying enough attention. But the more I read the more I could tell that I wasn’t the only one confused by it all. While I’ve noticed things like this over the decades of reading (boy, do I miss Special Interest Autos magazine), this is the first time to my knowledge that anyone has ever attempted to codify what was going on. There’s so many articles out there about 46-54 Detroit, a period that I’m starting to realize is a lot more interesting than the classic 55-70 interest that’s just about been mined to death. Makes me wonder what the auto industry would have looked like if the Chevrolet Cadet and Cadillac Interceptor would have gone into production, and influenced how the rest of the corporation would have gone. Er, make that “potential articles about 46-54 Detroit”. The one time that the edit function didn’t work . . . .
Wow. Thank you for taking this dive into GM’s B-body history. This shell game (or playing with a deck of 58 cards) with the different bodies is a real testament to the power that was GM. A fraction of this would have sunk the other US manufacturers. All this overlap in body sizes and designations among the brands quickly prompted images of the Sloan ladder cracking under all the weight. All the name shuffling among different bodies of the same brand, primarily the two Roadmasters in one year, shows that the habits GM displayed later on (in a somewhat different fashion with Malibu / Malibu Classic, retail Impala / fleet Impala, the Cutlass name on five different bodies in one year) had a distinct precedent. The whole affair started the day we ran the piece on the 49 Olds 88 a couple of weeks ago. I wondered what GM built on the B body in 1949. As you can see, that question led me deep into a rabbit hole that could have probably stretched into a 10 part Ken Burns documentary if I had not forced myself back into the daylight. I remain most fascinated by the 1949-50-51 Buick Special that were three completely different cars, and the fact that nobody I could find in any online source seems to have ever noticed. Agreed. JP really gives us great macro and micro on this; seeing how all the orphans splintered off from the main branch so to speak. But such a creative motherlode from this unwinding beast. What a fascinating story. I make my living selling manufacturing capacity. This gives me a close up view of how product design elements are so often a result from a need to share manufacturing lines and tooling. My hat is off to the ingenuity of marketers of resulting products. They manage to repackage design compromises dictated by manufacturing considerations into product features presented as the result of careful product planning and research to achieve a special feature or function. Compared to autos, the manufacturing services I sell are simple. I can only imagine how this works when making machinery at the scale and complexity of automotive manufacturing. And all without computers to help in the planning and implementation! Truly there were giants on the earth in those days. Very interesting if not a bit confusing trying to sort it all out. I personally think the 1950 B sedans with the vertical C-pillar are unattractive and stubby-looking. Given the short life of this style, it seemed that GM felt the same way. In 20/20 hindsight it would’ve made more sense for the Buick Special to debut the OB and Oldsmobile to limit their use of it to four-doors and maybe hardtop coupes while keeping two-door post models on the A body for buyers who wanted a light, fast Rocket 88. It also shows why Olds dropped wagons after 1950 (there was no OB wagon, all Fisher wagons were A-bodies and Buick contracted with Ionia Body Mfg to build the Estate Wagon). An excellent point on the wagons. If I had not stuck to 4 door sedans I think I could have kept researching this for the rest of the year. This really was a peak period for GM, not seen again across all brands until 1965. 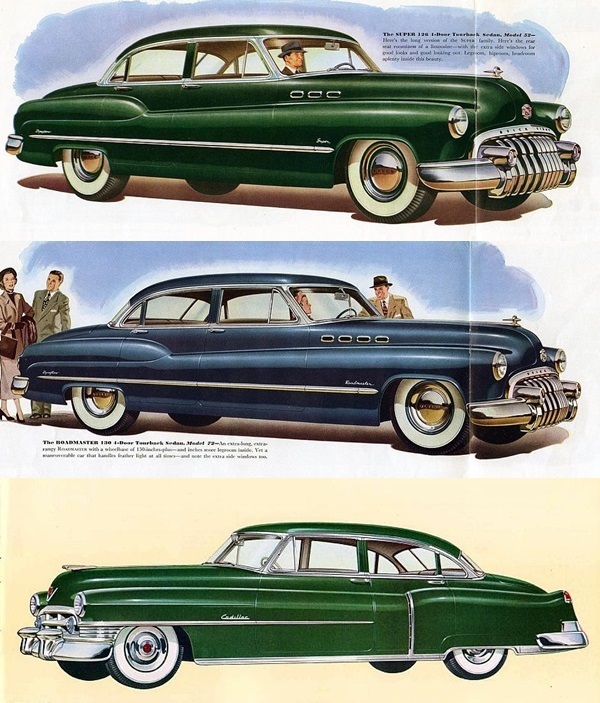 You can look on either side of the (perfect) 1950 to see greatness emerge from the streamluxe austerity of postwar, but I think think things went downhill and by 1952 the Buicks (in particular) were suffering overcurvature. There’s something about the 50 that beats the 51; putting the grille teeth over the front of the bumper somehow completes the shape. I could do a 51, probably over a 49. But I’d always be dreaming of a 50. I don’t think we will ever agree on that ’50. These were gone from the roads by the time I started paying attention and the first time I saw a picture of one I almost gasped. It was like in those old black and white horror movies when the human experiment had gone horribly wrong. I am still completely amazed that I had never noticed any changes in these cars from 1950 to 51 other than the grille. It seems I was far from alone. With a grille like the 50 had, you didn’t notice the rest of the car. Period. As a child, the only grille that ever matched that one in in-your-face-ness was the 58 Edsel. 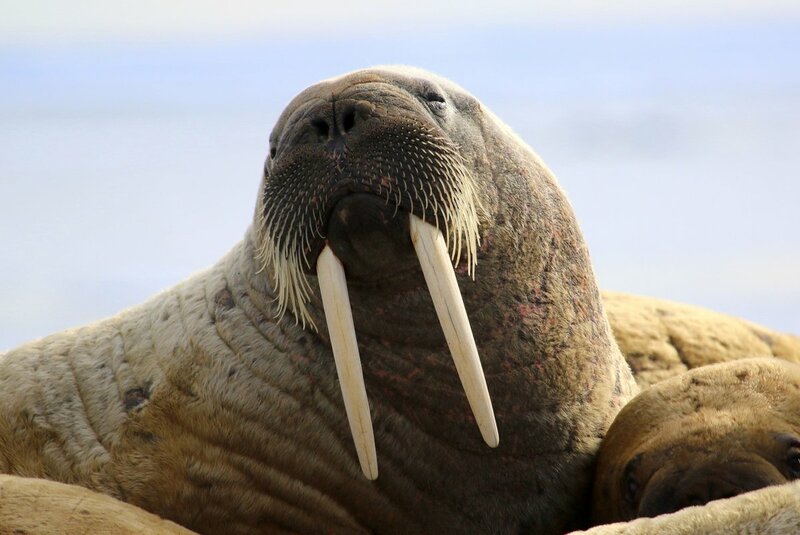 As for the ’50 Buick, I have only one thing to say: “I am the walrus, goo goo ga joob”. And as others have said, it was deftly handled by GM, with the exception of that ’49 Buick Super in part 1. That was pretty bad, saddling Buick with the last pre-war body. And it seems Buick knew that, as they didn’t seem to acknowledge the car in their sales brochures. These couple of posts were really informative. Bookmarked and top of the “re-read” pile. Thank you JPC! It goes to show, back then, what a GM division was like when you had an incredibly strong and powerful individual as your division head. And, at that time, Buick had one of pretty much legendary proportions. I always felt that, at that point in time, Buick was just about running GM. Harlow Curtice had run Buick since 1933 and was made Exec VP of GM in 1948 and President of GM in 1952. Ivan Wiles had been Curtice’s comptroller at Buick and became Division President after Curtice was promoted. He undoubtedly had some powerful political pull. 1950 Sedanet is my all-time fave Buick. This has been a fascinating study, one that paints a more human picture of GM at that time. Your noting the level of quality GM customers expected, validates once again my contention that the General was far beyond the pack during this period. +1. To be able to keep up the quality with all this chopping and changing going on behind the scenes from year to year (and within the year!) is just astounding. But I almost pity the poor Buick and Olds salesmen of those days trying to keep up on the latest product. Almost. In the post war era (beyond the pre-war carryover cars) there was really only ever just two bodies, with variations in their lengths and other styling details, in other words the A and C. Of course all of this is semantics, depending on how one defines “body”. In my dictionary, it means certain key architectural hard points, which the basic inner body structure defines, the most critical one being the cowl structure. In the pre -war era, when bodies were simpler, and there was more differentiation and stratification in the Sloanian ladder, there really were three completely distinct bodies. But that made no sense in the post war era. So there were two basic body structures: the narrow A body and the wide C body. And of course there were variations in the body length, as well as the styling, to some extent or another, as in the short-C 1950 cars. What’s critical, among other things, is whether the front end sheet metal (“clip”) fits or not. There’s little or no doubt in my mind that the front clip of the 1950 Cadillac Series 61 and 62 would interchange, the cowl structure and the rest of the key body hard points (except upper roof structure) are the same. The OB body is of course narrow, so it’s really just a variation of the A Body. And yes, I bet that the ’53-’54 Chevy/Pontiac body shared key parts of that early OB body. The truth is, starting with 1959, when all the GM big cars shared the same basic body shell, there really is no more C Body; or no more B Body. From then on, there was just one full-size body, the only real variation being in length and roof structures, which were relatively easy to vary. We all know that the ’63-’64 Cadillac coupe shared the same roof stamping as the Impala 4 door hardtop. Etc…. So it boils down to semantics. If you define a longer body variation with a different roof structure as a unique “body” then there were B and C bodies in the whole post war era. But in my book, there was always just an A and a C through 1958, and then a B from then on. With lots of variations. And lets keep in mind that all these variations were much easier to carry out in the BOF era, especially pre-1959, when the frames were mostly of the “ladder” variety, meaning the body played a very minor role in the overall structural stiffness of the final car. starting in 1958-1959, when the X Frame was used widely, the body sills were a key structural element, so that it would have been more expensive to have two unique bodies. And with the perimeter frame that was adopted across the board in 1965, the body became an even more critical component of the whole structure. It’s important to note that with the perimeter frame, cars were practically unibodies, with a front and rear subframe tied together with those two rather smallish perimeter sections. But these frames would have been extremely willowy without their attached bodies. My point being that with the evolution of body engineering becoming ever-more complex, it was incumbent on GM to narrow down from 3 to 2 bodies in the 1948-1958 period, and then down to one in the post 1958 era to the end of the BOF era, for full size cars. I would argue that GM went back to three separate bodies with the 1954-56 B-C and 1955-57 A cars. From the width numbers I came up with the B really did inhabit a middle ground in that short time. 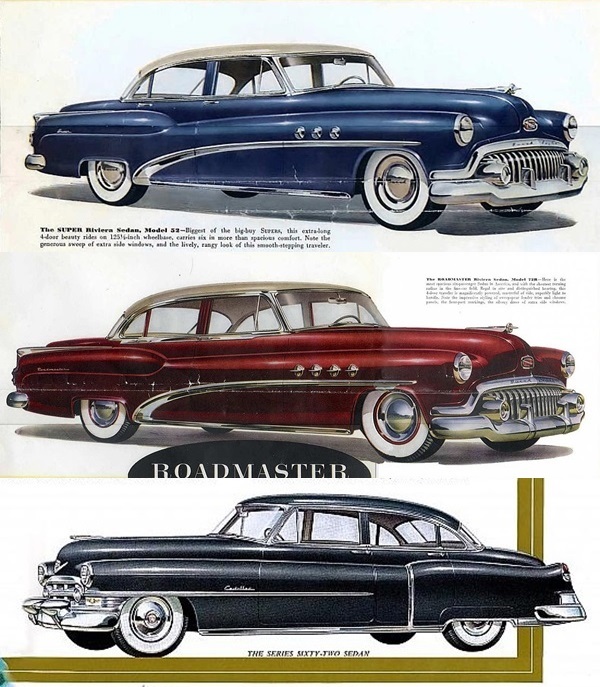 The windshields and A pillars were distinct between the 1954 B and C sedans and a close look at Buick hoods looks to me like the Special and Roadmaster hoods have similar creases and curves, but differences in spacing. Starting in 1959 and going into the 80s I think I would agree because GM was clearly sharing front clips between B cars and C cars, at least in the Olds and Buick lines, with all of the differences being aft of the cowl. Edit – a reader on an online forum notes that the grille of a 54 Roadmaster/Super C body is 4 inches wider than the grille on a 54 Special/Century on the B body. A quick look suggests that the 1957-58 B and C bodies may have been more in line with your theory. You may well be right, and I haven’t gone through those in full detail. And I came across that different width for the grille too. But here’s what’s a bit odd: The ’54 Buick junior and senior series (B & C) share the same 59″ front track, but the C has a decidedly wider 62.5″ rear track. That would mean that if the front end sheet metal really is wider, than the C version’s front wheels are going to be deeper in their wheel wells. Which sort of looks that way in the brochure, but then those are all renderings, and not really 100% accurate. I think the body of evidence supports your conclusion. Fascinating and well presented, and such a wealth of material and detail. I see Paul’s point about the A and C covering most bases, but there seem to be enough differences for at least a sub-set of the C (known as the B) to be recognised. Personally, I find the 6 light, thin pillar of the 1951 cars to be much more attractive than the 4 light design. Spectacular articles! It just confirms the amount of “churning” that went on in the US auto industry post war. With no real competition, there was an amazing amount of extraneous work going on inside to produce what were very similar cars. I guess it’s true that work always takes up the time allotted for it. An absolutely stunning article – well, pair of articles really. Definitely a top contender for a Curbie award. Since first delving into Burness’ Spotters Guide books back around ’80 I was taken by that body with the strange-looking vertical C-pillar, and how short-lived some GM styles seemed to be in the early fifties. I had no idea just how strange some of the body changes were in those years. I wonder how Buick Special customers felt, getting such a radically new car year after year back then? Did some have troubles fitting that wide-body into the garage, and wonder just what they’d bought? And I wonder if there was a difference in how these cars felt to drive? I wonder if supplier constraints had anything to do with the odd progression of new body styles at GM – there were still quite a few parts shortages holding up the lines throughout the late ’40s from what I’ve read. Also, I’m all heart eyes over those Cadillac Interceptor prototypes/drawings. Does anyone else see a bit of Citroen DS in them? And that futuristic car came almost a decade later! Why didn’t GM build these? (Actually, I know the answer, and GM almost certainly did the right thing to stick with more conservative, evolutionary designs). It’s seems clear to me that despite the confusion, the postwar redesigns (along with the new V8s and automatic transmissions) mark the beginning of GM’s three-decade heyday. It reminds me one thing, Chrysler cars seems to have the same ideas with their bodies from 1949 to 1956 do anyone agrees? For 1949,the Buick Division of General Motors,concentrated their redesign on the Roadmaster and the Super,leaving the ’49 Special,to squeak out another year with the 1941-’42 body style.There apparently was little incentive to redesign the ’49 Special,as the industry was more concerned with the better selling,larger models, (Roadmaster and Super).The B body Special,was indeed redesigned in August of ’49,but as a 1950 model. As far as the 1949 Buick Special,not being included in the new Buick Looks Fine for ’49,sales brochures,why include pictures of a car,that had not been redesigned,along with the two models that had been? 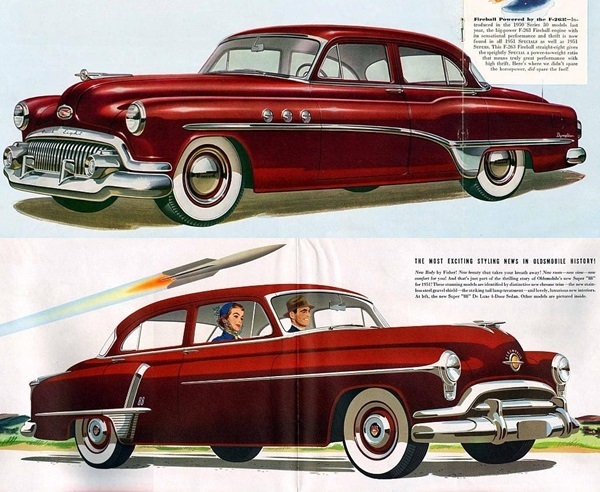 I disagree that there was no incentive to redesign the Buick Special for 1949. The Special had been Buick’s highest volume model for years. The problem was that there was no body available for a 49 Special. Not unless Buick had been willing to use an A body like Olds did with the 88. The 1950 Special had to have been one of the great new-car bargains of the century (sorry), being simply a de-trimmed Buick Super (big body, small engine). The Special from 50-53 was either on a shortened C body or a butched-up A body. Not until 1954 would a legitimate B body show up again.